Throwing a terrific gala event requires careful planning and a little bit of innovation as well. Nothing wows guests more than proving that you are up to date with the latest audio visual technology and event lighting trends. One of the best ways to ensure your gala event stands out from the crowd is by investing in professional and cutting-edge event lighting. Here are three of the latest up and coming lighting trends in the world of gala event planning that you might like to consider for your next function. Creative use of themed pattern projections is a great way to make your venue and event stand out in a unique and colourful manner. Themed pattern stencils lighting – known as ‘GOBOs’ in the industry – are also excellent for creating a specific focal point in the room and separating large, otherwise empty spaces. If your event is being sponsored or used to promote a specific brand then you might also choose to project that company’s logo onto the floor or walls. Ensuring that their enterprise remains the centre of attention. Like GOBOs, table spot lighting is an excellent way to add a touch of professionalism and wow-factor to your gala event. By illuminating each individual table you can accentuate centrepieces and create a more sophisticated ambience in the room. Highlight the positive elements and shade the negative or less-interesting aspects. While most people planning a big gala event will focus mostly on the interior lighting of their function, it is also important not to neglect the exterior of the venue. By using moving gala event lights outside your event you can create an electrifying and enjoyable atmosphere for your guests from the moment they arrive. Exterior building projections are another great way to add excitement to your event. Remember that you only get to make one first impression, so it is worthwhile making it a good one. 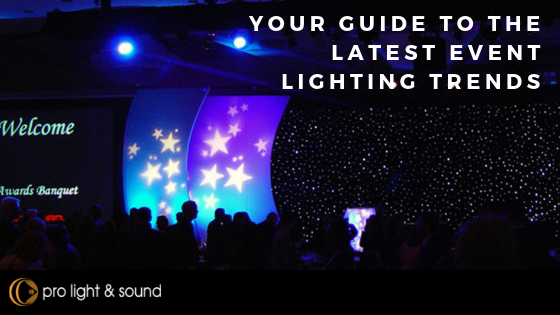 If you are planning your next Gala event get in touch with a Pro Light & Sound expert to make sure you make the best possible impression and wow your attendees with the latest in event lighting and AV technology.